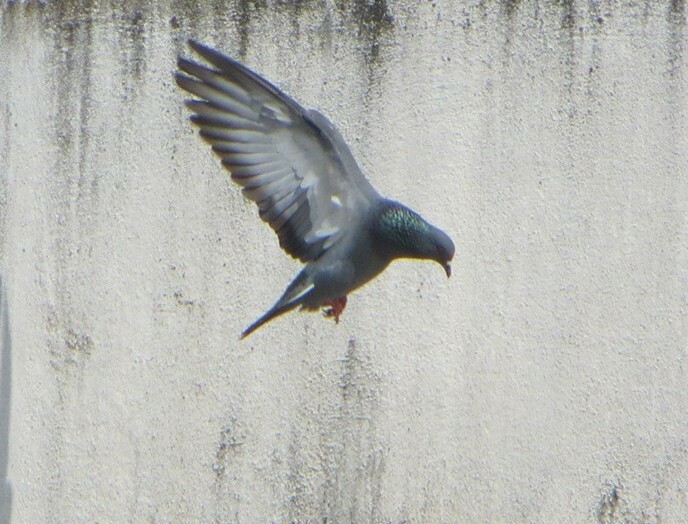 Many I know consider rock doves / pigeons to be a major public nuisance. These feral birds are accused of being uninvited and parasitical guests to cities. They are despised for being noisy and intrusive. Other items in the list of accusations include spreading diseases, destroying air-conditioner units and pooping just about everywhere. Rock doves scavenge for food, as well. At public parks, inside garbage dumps and near food-loading docks. In fact, perhaps only their iridescent feathers and salmon-pink feet separate them from house crows – another despised residential bird in my city. The reason I may think that is because I belong to the alpha species. One that has been making planet earth as uninhabitable as it possibly could be. It is important to know that once upon a time the rock doves lived only in rocky coastal cliffs. Far away from human beings. Since then they haven’t grown invasive just to satiate some organic greed. They have never instigated wars to occupy land for personal gains. Or blurred the lines between the wilderness and vast living spaces. What they have done is, like every other species of birds, adapt to a rapidly-failing ecosystem. One that we have changed so much to satiate our greed and nihilism. The ancestors of rock doves used their navigation abilities to serve us throughout history. And yet now we find it fit to complain about how they poop on our vehicles and make a lot of noise. The hypocrisy is that we have been pooping on every single species, including our own, with dubious consistency. And with far worse consequences too. Let’s not blame these birds for behaving how we forced them to. Thanks for the info, John, I wasn’t aware. Great to know that they have such rock-solid roots! Reminds of where I live, in a rural area where people complain how the deer eat their landscape plants. That’s unfortunate. In fact in a few hill stations, the same accusations are thrown at spotted deer with regards to crops. Some even poison them to save losses. Sigh. a well placed mirror Christy. Thank you! Thanks Tio, always a pleasure to hear from you. As with crows too, I do find that they too matter, no matter how invasive and rude and “poo”py they might be! I once had a rescue mission where an injured bird – a juvenile, I now realize, with internal injuries too – was given to me by the kids in school. Brought her home, but she wouldn’t feed, only drink lots and lots of water. She made it through a day and a half before she died. Just last year. Still, I’m happy she’s gone to a safer, more friendly place. I’m almost violent in school, when it comes to either the cleaning staff or the kids shooing away them birds or destroying their nests. Thankfully other measures are in place and they now being prevented by nets, casing, to roost near the buildings. Yeah, crows can be rascals but then again who can be blamed for that but the alpha members of civilization. It might be a matter of time before their cousins Rufous Treepies go the same way too. Lovely to hear about the safe preventive measures at your school, keep at it birdie soldier! I like them somehow. They are peace-loving and seemingly harmless. Thanks alka! Until recently I didn’t have much love for them, a late realisation that they ve made the best out of a terrible situation. Perfect sentiment K! I love that you can’t imagine a home without them. Of course, I share your sentiment for these well-adapted birds. In America, the government ‘culls’ or otherwise euthanizes tens of thousands (or more?) due to human whining. It seems a bit disingenuous of us to first destroy their habitat and then be mad when they invade ‘ours.’ Crazy people. About that extinction event, read the book on the subject, ‘Sixth Extinction’ by W. Kolbert. Extraordinary subject and difficult to refute. Thanks Shannon for the book recco, sounds like an intriguing read. I really ought to spend more time in the theories of it, this sounds like a great platform. It’s sad indeed, and you said it perfectly with your line about being disingenuous. Sounds like the foundation of tyranny and slavery! It is EXACTLY tyranny and slavery. Exactly. Let’s hope during its next cycle the universe makes squirrels the alpha species. Hahaha you d be just fine Shannon, believe me! Thank you for sharing this info though, I didn’t know that pigeons used to live on coastal cliffs o.o and indeed they are really amazing birds for having adapted so well to their changing surroundings! I could so get behind #teampigeon. I’ll make T-shirts and coffee mugs too ❤ thank you for stopping by with your birdie love. Fun fact: there are pigeon rescues for injured/lost feral and domesticated pigeons. 🙂 I’m fostering one right now!